1 Cowbirds are a type of blackbird. Males have brown feathers on their heads. They have a different way of life from most birds. Their babies are raised by foster mothers! 2 Cowbirds are nomads. They spend their lives wandering from place to place. In the past, cowbirds followed huge herds of bison across the Great Plains of North America. The bison stirred up insects and loosened grass seeds. They made it easy for cowbirds to get plenty to eat. The birds had to stay on the move with the herds. This made it hard to build nests, lay eggs, and raise young chicks. How do you think these birds solved their problem? 3 Cowbirds lay their eggs in the nests of other birds. 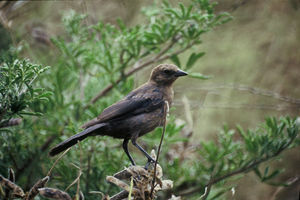 Cowbird females put all their energy into laying eggs. They may lay as many as three dozen eggs each year. They watch other birds until they find a female who has just begun laying her own eggs in a nest. Then the cowbird sneaks in while that female is away getting food. They choose from warblers, sparrows, and more than two hundred other kinds of birds as foster mothers. The female cowbird lays her egg in the stranger's nest and leaves.